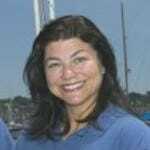 Learn the “ins and outs” of chartering in the Mediterranean on modern well-maintained yachts with male and female captains and ASA instructors. 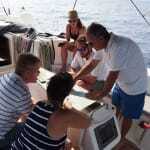 Practice med mooring, interpret Greek weather and navigate ancient Greek sailing routes. 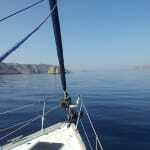 Enjoy the culture and history of Greece as as you sail, snorkel and swim the calm, clear waters of the Saronic Gulf. 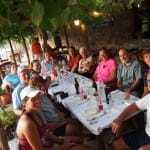 Explore amazing ruins, hike a volcano, and dance and drink Ouzo at the village Taverna while making new sailing friends. September is perfect. The days are sunny and warm during the day for swimming and cool enough for sleeping at night. 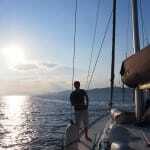 Come as a single, a couple or a group, captained or bareboat, on this “bucket list” adventure. Get behind the wheel with an instructor by your side on our well maintained and equipped yachts. 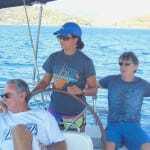 Captains Valerie, Stephanie, Derrek, Harold and Margie will be happy to work with you based on your sailing experience, or you can simply sit back as the magical islands of the Saronic Gulf slide by. Help us plan the trip using local weather information and charts. Then, take the helm if you wish, as we sail to our new destination. 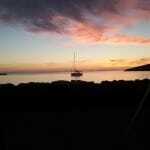 We can teach you how to med moor a large yacht and when you are comfortable, you can try it on your own. 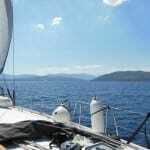 Those with a little more experience can bareboat as part of the flotilla knowing that help is nearby. 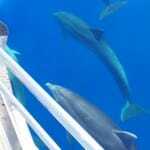 Some trip highlights include snorkeling an ancient town only 7 feet below, watching dolphins swim under the boat in crystal clear water, climbing an extinct volcano with amazing views and dining at a country taverna where the owner makes his own wine and olive oil. 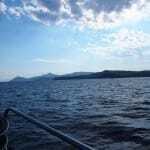 Of course, it’s amazing just to watch the beautiful mountains rise up out of the sea as you sail by knowing that these islands represent thousands of years of culture and history. A typical day begins with breakfast on board. 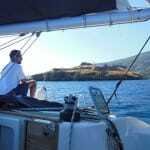 Then, we set sail for a secluded anchorage where we can swim and snorkel in the clear waters of the Mediterranean and have lunch. By mid-afternoon we have med moored at the next village. Dinner is ashore in a wonderful taverna of your choosing featuring local delicacies and fresh fish, or you may prepare your own meal on board. In the evening do some dancing, relax with an after dinner drink and take a walk along the water front or through the town. Two 50’ Beneteau Cyclades and one 49’ Bavaria yacht, all with multiple cabins, some with private heads and showers, will be crewed by USCG Captains and ASA Instructors. 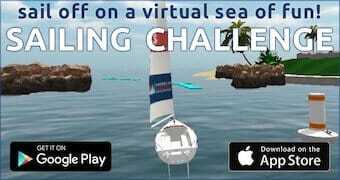 You can take the helm with an instructor by your side and practice your sailing and docking skills. Or relax and enjoy as we sail to a new island. For breakfast and lunch, crewed boats have starter provisions on board and the crew will cook your first day’s meals. Then, each guest will be asked to plan, shop and cook one meal during the trip. Wonderful fresh baked breads, fruits, vegetables and meats are available for purchase on each island we visit. 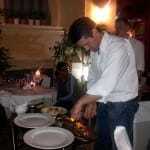 Dinner is on your own at a local taverna or your may use the galley on board. We have a wide variety of well equipped and maintained sailboats available. Bareboats range from 35’ to 50’ and include catamarans. 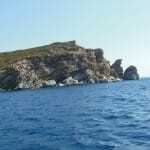 You will do your own provisioning both at the start of the trip and as you travel through the islands. We will help you with chart briefings and tips for the area. We are also happy to help you med moor, but you should have at least two crew members that are pretty comfortable with boat handling. You may want to fly into Athens a day or two before the Flotilla departs in order to enjoy the sites and to get acclimated to the time change. 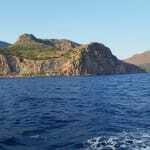 Once we get underway, there are many beautiful harbors and bays to stop in with everything from lively tavernas, shopping and cultural sites to quiet secluded anchorages. 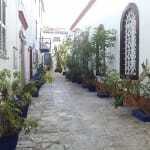 A few of our possible stops include Epidavaros, Methana, Poros, Ermioni, Aginea, Hydra and Angistri. Participants will receive a welcome basket, a commemorative ASA Flotilla T-shirt, and dinner with the Flotilla at an intimate, countryside taverna. 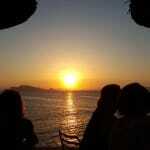 On Friday you will disembark in Athens. 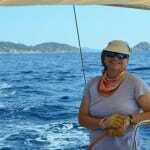 Captain Valerie Weingrad, owner of Custom Sailing and an ASA Instructor, has been running sailing charters and ASA flotillas in Greece and throughout the Caribbean for 15 years. 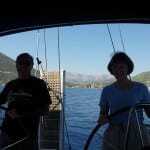 Captains Harold and Margie own Island Dreamer Sailing School. 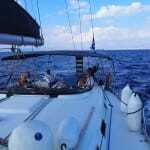 They have been teaching couples to sail for the last 8 years in Miami and the Florida Keys, and started sailing in Greece in 2013. Captains Derrek Polt and Stephanie Mansberger live aboard their 45′ sailboat and have been teaching ASA sailing classes to couples with Island Dreamer Sailing School for 4 years. Captained – $1,985 per person based on double occupancy. Ensuite private heads are available at $300 additional per person. Pricing for singles is available. Please contact us. Base provisioning and boat expenses included. 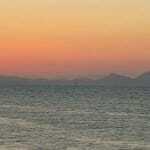 Bareboat Rates – 37′ to 50′ boats are available including catamarans. Please contact us for pricing. 2,000 € damage deposit required. Captains Harold & Margie made our trip to Greece a wonderful, relaxing and informative trip. 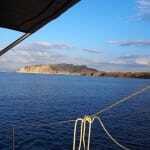 Sailing, snorkeling and dining in the Islands was a dream come true. 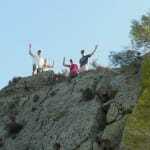 The local people were welcoming and full of smiles. We felt at home on the boat as well. Capt Valerie Weingrad did everything possible to make our trip an experience we would remember for a lifetime – from sharing her treasured favorite places on earth with us; the hidden jewel seaside towns and local fish taverns to scrumptious bakery. Terrific husband-&-wife co-captains, Harold & Margie (also a great chef) Ochstein, Hoosiers who moved to FL! 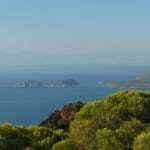 Took us on a hike to the top of a volcano, ate at taverna along the way. The 6 of us clicked right away. 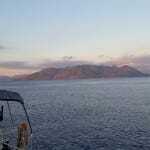 I had the best vacation I have EVER had when I sailed with Captain Valerie to the Greek Islands. Custom Sailing did a fabulous job of making sure that this was a experience that was both fun and memorable!